I love these SOA boxes. Your card us great-they always are great! Love that starry sky Mo!! I'm just now learning how to use those "small" stamps in my stamp sets! Didn't know they'd be so much fun to work with. Hi Mo ~ This is such a wonderful card! 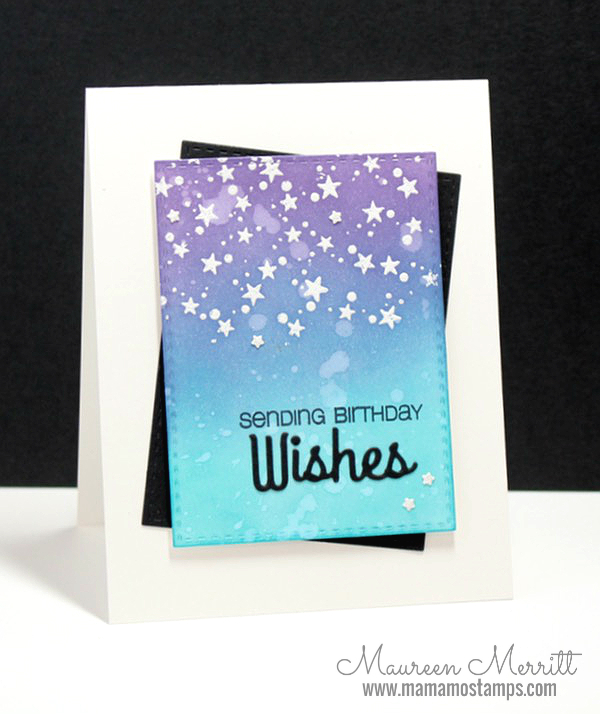 The stars and white splatters make such a nice addition to this card, as do the water spots. I've been totally in LOVE with Distress Inks for the same reason you used them on this card. I can't WAIT to get my hands on this latest SOA box!! Thanks for sharing. LOVE your card, Maureen!!! You have a gift for taking the simple and elevating it to a level of elegant. I like the way the color fades into the next. Thank you for sharing. Beautiful card Maureen! I love the dreamy quality in the night sky! Starry sky with birthday wishes? Absolute perfection! Bravo! I love the sky and the way the colours fade. Very nice Maureen. This card reminds me of living in the desert and gazing up at the stars at night. Very Pretty, and you had captured that thought by the colors you used. Your cards are so great and I love how you use the SOA box. Cute card and so colorful. It is always nice to see what folks can do with the same products.